“Since the invasion of Iraq in 2003, the United States has entangled itself in war and occupation throughout the Middle East and North Africa. As of 2018, we are currently involved in military action in Libya, Syria, Iraq, Afghanistan, Yemen, Pakistan, and Somalia. “According to the Constitution, the right to declare war belongs to the Legislative body, not the President. Yet, most of these acts of aggression have never once been voted on by Congress. For one thing, the bar is very low in these matters. I’m not aware of a single candidate for Congress who has so much as hinted at what the federal budget should look like or even been asked to do so. I searched Democratic Congressional campaign websites and found a grand total of eight that mentioned any sort of opposition to war at all. (Most don’t even mention the existence of foreign policy.) Of those eight statements, Ocasio-Cortez’s five sentences are (were) in some ways the strongest. She lists major current wars. She calls them acts of aggression. She says she wants to end the forever war, strongly implying that she wants to end each of the wars she named and any others like them. She says she wants to end bombings, not just troop deployment. And she notes that the bombings are counterproductive on their own terms. But what’s been revealed during the time that the five sentences have been gone from the website has been quite disturbing, even if typical and predictable. People haven’t just invented excuses. Some have denounced any criticism or questioning as inappropriate. 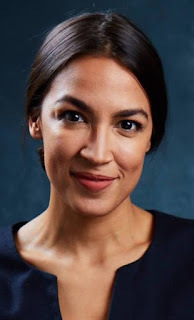 Others have claimed that Ocasio-Cortez should not be held responsible for her own website at all. Others have suggested that she shouldn’t have time to deal with a website until after she’s elected (and has less important work to do than campaigning?). Others have, of course, used the Argumentum Obamatum which proposes that any candidate you like is secretly for peace but wise to pretend otherwise while campaigning (and perhaps even while governing). David Swanson is an author, activist, journalist, and radio host. He is director of WorldBeyondWar.org and campaign coordinator for RootsAction.org. Swanson's books include War Is A Lie.